ALERT: The ASG/6 was an Award-Winning Finalist in the Education/Academic category of the National Best Books 2008 Awards, sponsored by USA Book News. (Go to the Archive Page and choose the 2008 PDF.) Check back to see how the improved 7th edition does! More Testimonials about The Adult Student’s Guide! 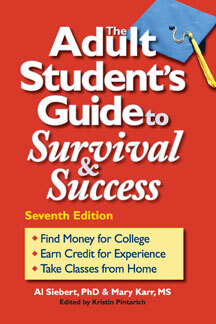 Order The Adult Student’s Guide to Survival & Success, 7th Edition from Practical Psychology Press, Amazon, or call 800/888-4741 and have your credit card handy.